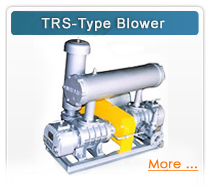 Roots Blower for RSS type --- 0 -8,000 mmAq. Roots Blower for RSW/EV type ---- 0-10,000 mmAq. Roots Blower for Multi- Stage TRS type ---- 10,000 - 20,000 mmAq. Roots vacuum pump for RSV/EV type: up to -5, 000mmAq. 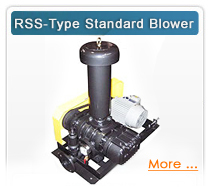 RSS-series are standard 3-lobe roots blower , its structure is very compact and have higher running reliability and long life, the inlet sizes are from 1.5" to 14". 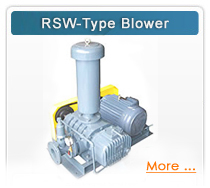 RSS-series can run under the pressure of 80Kpa without cooling water, and the biggest capacity can be 260 m3/min。Our company has also developed RSW water-cooling series blower for the pressure between 80Kpa and 100Kpa. So the biggest pressure of two-stage can be 200Kpa. 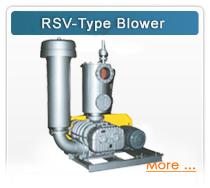 RSV-series are also developed from RSS series, the biggest pressure can be -500mmHg. •Adopt high-grade computer-control balance adjustment (G2.5), reduce the vibration and noise. •Machine impeller by 6 coordinates NC shape to improve higher accuracy. •Gears have special treatments, and manufactured according to JIS1 gears accuracy. It can increase the life and decrease the noise. •There are all lubricant on both end oil tanks, the seal design can not only protect lubricant from pollution and reduce obstacles, but also promise that the gas flow will not be contaminated. •It can add piston ring and get higher efficiency and longer life. EV series 3-lobe roots blowers are researched and developed on a basis of RSS series, the biggest feature of this blower is high rotation speed( the maximum can be 4000RPM)、high capacity. With the breakthrough of technology and the modification of practical application, EV series bowers have higher efficiency、higher pressure、lower weight and other features. The inlet sizes are from 2.5”to 14”. The pressure of single blower can be 1 kilogram. Great linear structure of impellers, reduce sectional area of rotors to improve capacity of blowers. 180 degrees vertical structure between inlet and outlet, reduce its pressure loss of blowers. 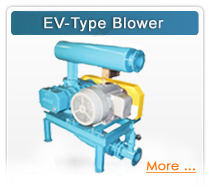 The vacuum of single EV blower can be -500mmHg, and the two- stage EV blower can be -650mmHg.